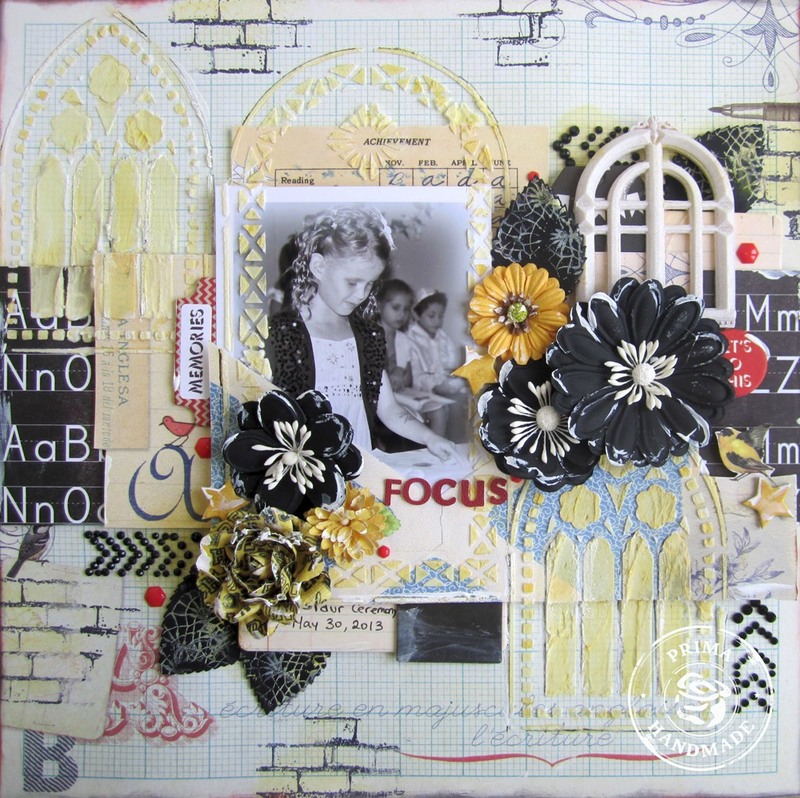 I created this layout to be displayed in the Prima booth at CHA and it also got published in August’s Prima ArtZine. This is a photo of my daughter focusing on her lines, which she delivered perfectly during this ceremony. 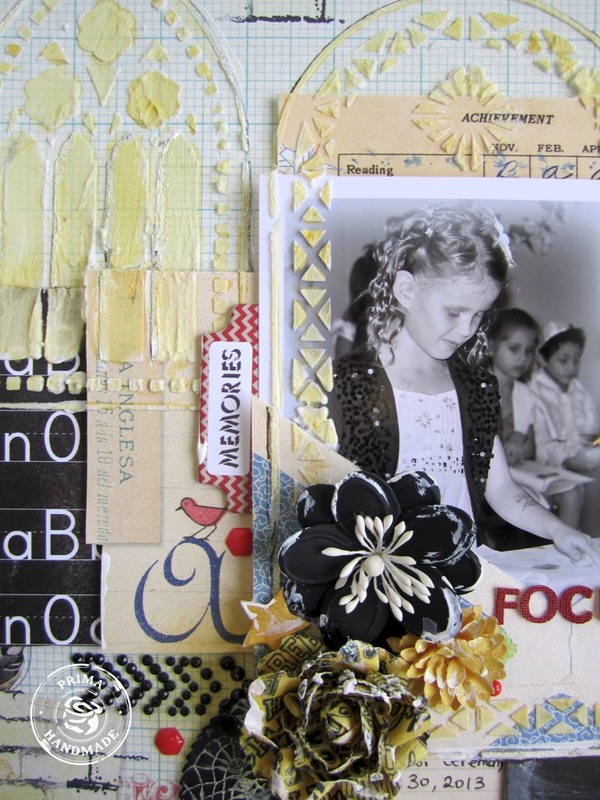 I used the School Memories collection for this layout as it fit the theme perfectly. 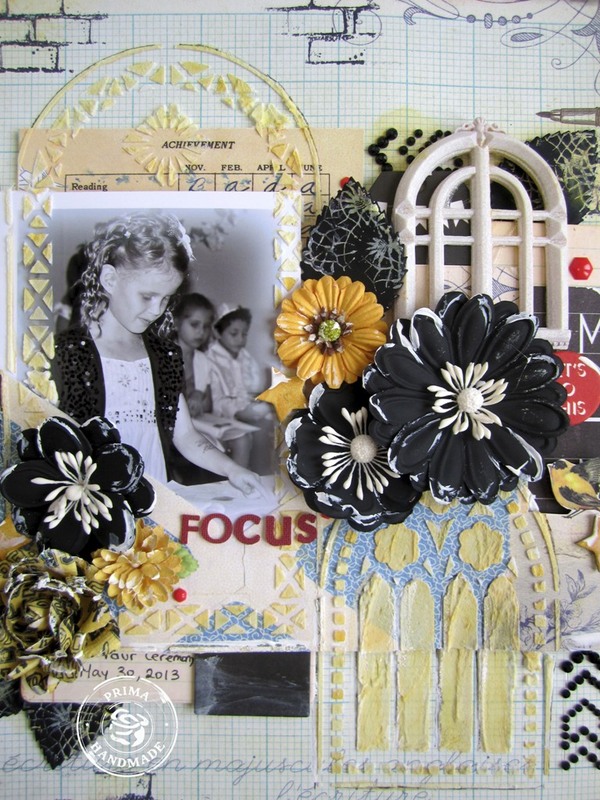 I used the La Tiza black flowers as a perfect accent for this layout. 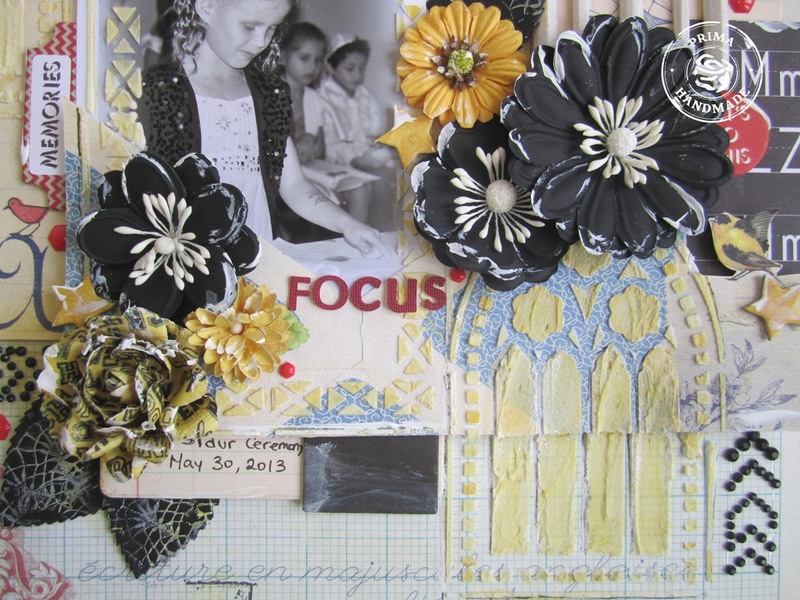 The La Tiza leaves were stamped with the Vintage vanity doily for some texture”. The large cathedral windows stencil from Finnabair was masked in Light molding paste and then painted in Tuscan sun Shimmerz. Fabulous combination of colours and textures – so sharp, and modern, and funky! Wowwwwwwwwww! This is gorgeous! LOVING how you made those arches and loveeeeeee the flowers!!! Love this layout, This is the 1st time Ive seen this stencil used, I have it but havnt used yet. I like the look it gave to your LO. It's such a gorgeous photo and you have made a truly amazing lay-out to go with it! I love all the pretty little details. Such a gorgeous page! I just got that syencil last week, so the inspiration is perfect timing for me' hope you have a great weekend! Wow!!!!!!! This is just gorgeous! The use of those stencil here is PERFECT!!!!!!!!!!!!! This is stunning, what a great mix of bold colors and love the window stencils too… well done..
Wow. This is just gorgeous! Another beauty Keren, something your daughter will look back at proudly. Its times like this that are so important to scrap ..
A really great page Keren…love all the beautiful details and the super colouring! Fabulous page!